To protect against fraud and increase transaction accuracy, today’s financial institutions require a new approach that eliminates excessive handling and rekeying, and also evaluates teller transactions at the point of presentment. ARGO’s Teller Payments captures 100 percent of transactions in real time and provides tellers with more time to speak to customers about cross-selling and referral opportunities. The solution offers additional integrations to improve fraud management, increase efficiency throughout the organization, and reduce the amount of time spent monitoring suspicious transactions. 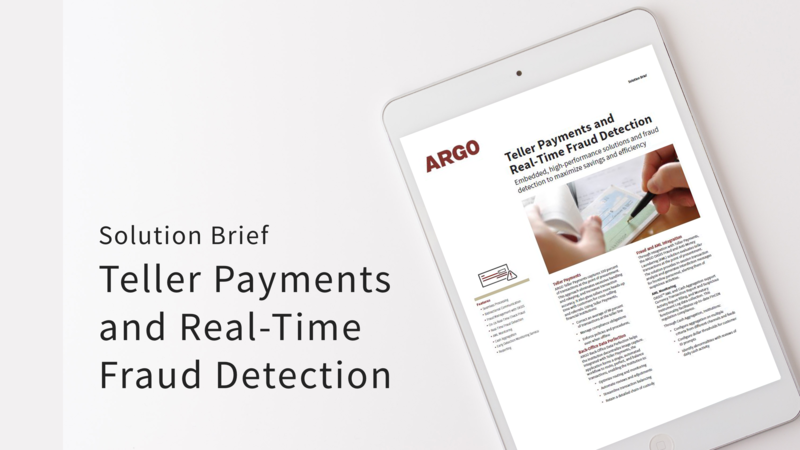 Download our Teller Payments solution brief to learn how ARGO solutions and services for Teller Payments, Fraud & AML Monitoring, and Early Detection Monitoring can support your organization’s fraud prevention efforts and enhance operational efficiency.